Hyvi is an up-and-coming social platform for discovering new podcasts. 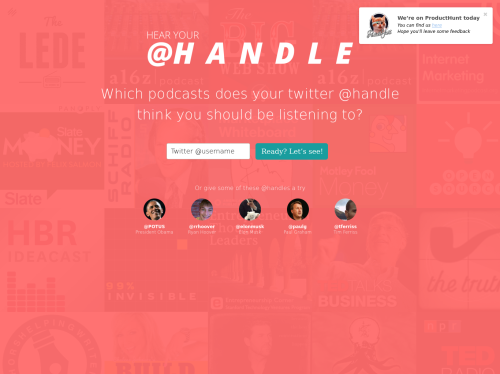 Whether you want to learn more about what your idols are talking about or you’d like to find podcasts that cover your own favorite topics, 'Hear Your @Handle' will help you access the right content. All you need to do is add a Twitter handle, and 'Hear Your @Handle' will match your last fifty tweets with ten interesting podcasts from all over the web. The service is available to everybody, but we hope it will especially help the growing group of millennial consumers. This group especially is starting to take an interest in the podcast space, but they don't necessarily want to spend the time listening through different shows to find the content that’s right for their unique interests.